The growing demand for energy, coupled with increasing environmental scrutiny is creating many conflicting challenges for power and utility companies. To maintain service continuity, there is a heightened need for effective power risk management and insurance. Aon has dedicated power and utility specialists that support the evolving risk management and insurance needs for power and utility companies worldwide. We provide comprehensive knowledge of the regulatory, financial, technological, environmental and geographic aspects of global power generation. Our worldwide presence allows us to provide a dedicated local risk management and insurance service for power and utility companies, backed up by global power and utility resources and expertise. The combination of global strength and local knowledge means that we can provide accurate peer benchmarks, develop new markets and capacity to increase competition and minimize cost, create new products and services, and control the claims process to ensure fair and swift settlement for our clients in the power and utility industry. With expertise in all areas of power generation including fossil fuels, sustainable and renewable energy and nuclear power, we help power and utility companies identify, manage and mitigate risk exposures cost effectively and efficiently. By combining our skills with a comprehensive analysis of a client&apos;s risk tolerance, we can provide a clear assessment of the total cost of risk a firm or project faces. We offer expert risk management and insurance support throughout the lifecycle of a power project. 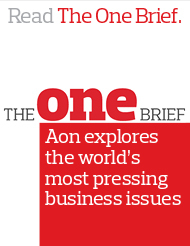 Aon is committed to offering innovative power risk management and insurance solutions to the challenges that the industry faces around the world.